“One of Mandela’s close friends in the 1950s was the Welsh-born pianist Harold Rubens, who moved to South Africa when his prodigy career dried up (he is pictured below as a boy, playing for George Bernard Shaw). A brother of the novelist Bernice Rubens and the hero of her novel, Madame Sousatzka, Harold became active in anti-apartheid activities. His home became a secret meeting place for Mandela and other leaders of the resistance. When confidential plans were discussed, Harold would sit at the piano and hammer out ffffs so the conversation could not be picked up on secret service microphones. 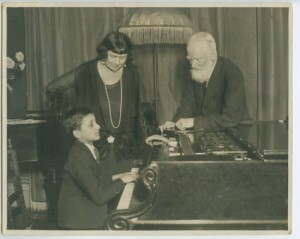 Harold Rubens was a professor of piano at the College of Music in Cape Town, which was the music faculty of the University of Cape Town. I was a pupil of his from 1957 to 1961. To describe Harold Rubens as a colourful individual would be an understatement! He was very short and had a complicated personality. Actually, he terrified the living daylights out of me. I would stand outside the door to his studio with butterflies in my stomach! We all knew that Professor Rubens was involved in anti-apartheid activities, but most of the people I knew were. I don’t think that any of us realized that he was engaged in the activity that Mr. Lebrecht has written about. I called two of my good friends who were at the college with me over the weekend and neither of them knew about this. And to see Harold Rubens playing for George Bernard Shaw makes me feel ancient! !